Welcome to F.L.Costello & Co., SpeedQueen and Unimac's sole laundry equipment distributor for New South Wales, Western Australia and the Australian Capital Territory. We import the largest range of premium quality commercial laundry equipment and support our customers' investments by supplying market leading parts and sales back up, with our factory trained technicians delivering our ‘same day’ service commitment. Our full range of products is supported by staff with specific ‘Speed Queen’ experience in excess of thirty years in both parts and service, ensuring bench mark results since 1955. 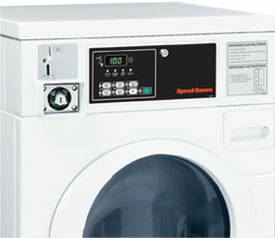 Browse our great range of premium quality laundry equipment and contact us if you´d like a customer representative to call or visit to explain in depth the true value of the products and services we provide. We invite you to experience the ‘Speed Queen’ difference. A premium commercial washer is more cost effective, efficient and environmentally friendly than standard domestic equipment. Ultra tough machines with basic robust controls designed to withstand the stresses of a mine site environment. Also well suited to other similar high volume, multiple operator applications. Highly efficient machines designed with durability and security in mind, perfectly suited and displayed in laundromats and rout operations world wide. Laundry equipment solutions tailored to your individual business requirements, from the smallest single machine installations to the biggest of private and public sector operations.